Easy Graphic Converter New version 3.0.0 was released!! Are you a website designer? Are you an ad banner designer? Are you tired of studying too complex image processing software? 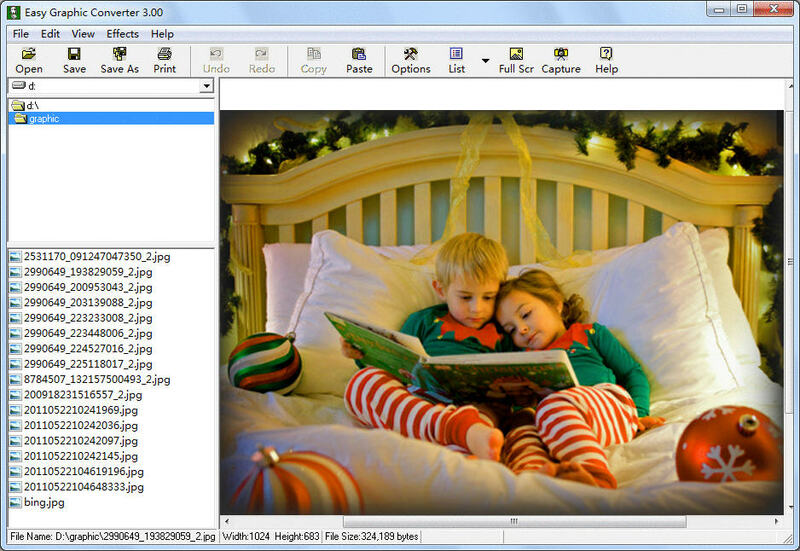 Now, you may choose Easy Graphic Converter, a very small image processing software with powerful functions. It is as small as only 2 megabytes. It's so easy to use that you would learn how to use it within 1 hour. It's so cheap that you need only pay one-time registration fee US$19.95. No matter you need a copy for yourself using, or you need to order a copy for your company, it's the right choice. Who could refuse a too lower price with yet powerful functions? Easy Graphic Converter is a powerful and easy-to-use image converter, graphic converter and resizer. It allows you to convert images between the most popular formats, It supports reading graphics of PNG, JPG, JPEG, GIF, PSG, BMP, PCD, DIB, ICO, PSP, ICB, PCX, PBM, PGM, PSD, PPM, EMF, WMF, VST, VDA, TIF, TIFF, WBMP, RLE, SGI, and more. It supports saving graphics to JPG, GIF, TIF, JPEG, PNG, TIFF, DIB, BMP, ICO, WBMP, WMF, EMF, TGA, and more. It supports screen capturing with different ways. It supports more than 50 different filters. It supports unlimited UNDO and REDO operations. Open and view 30+ images formats including PNG, BMP, JPG, PSD, GIF, DIB, ICO, PSG, ICB, PCX, PCD, PSP, PBM, PGM, PPM, VST, VDA, EMF, WMF, TIFF, TIF, RLE, SGI, TGA, WBMP, and more. Save and write more than 10 mages formats including PNG, BMP, TIFF, GIF, JPG, ICO, DIB, TIF, WBMP, WMF, EMF, TGA, and more. Support capturing screenshots from many ways including [Capture full desktop], [Capture full screen], [Capture last active window], [Capture ICON Area], [Capture by every windows]. Support more than 50 filters like noise, contrast, soften, blur, mosaic, gray scale, tweak, colorize, polarize, shake, swap, swirl, sharpen, stretch, lightness, and more. Stretch image to ICON size and save as ICO file. Full options of capturing, images formats, and other. I have used Easy Graphic Converter a few times to convert images from PNG to ICO and it worked perfectly. Useful programme - Does a wonderful job when converting my graphics. I love the full-screen view feature. Plus all the effects are a bonus and put it above all the other programs out there. conversion done it seconds!